Mercedes popularized the sleeper performance car, or Q-car, by sticking massive engines into innocuously styled sedans. The normal 300SEL of the 1960s was a nice luxury limo of its time, but it wasn't exactly a barnstormer. Stick a 6.3-liter V8 in it, like Mercedes did in 1967, and you have the stuff legends are made of. Imagine, a neatly styled German sedan with the power to scare hooligans in GTOs. The Germans are good at sticking bonkers engines in relatively non-descript bodies. 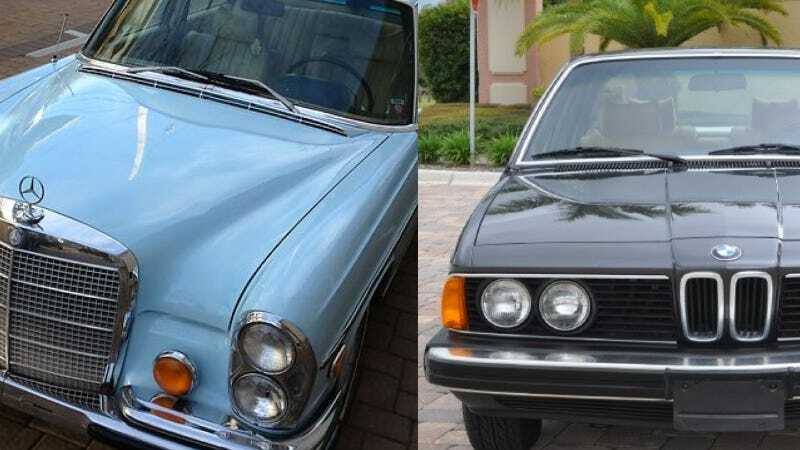 Remember the E28 M5 or the absolutely killer Mercedes 500E? And today, the E63 AMG wagon has to be the ultimate Q-car, as a real load lugger that will startle Cayenne Turbo drivers outside of the private school. The Mercedes 280SE 4.5 might live in the shadow of its bigger 6.3 brother, but there's no way you can call it a slouch. Underneath the beautifully styled hood is a 4.5-liter V8 with 225 horsepower routed through a three-speed auto. This is no sports car, but it's a slick German sedan with a surprisingly brawny engine. This 1973 one is shockingly original, one of the cleanest 280SEs I've seen. Maybe because most of my experience with Mercs of this vintage have been rusty, project cars in the driveways of elementary school friends. But this clean example has everything, from the period wood dash to the perforated headliner and lovely cream interior. The color isn't the most striking Mercedes ever offered, though. And this is from when Mercedes put their cars together with unbelievable precision, so this is unlike any other 1970s car. $15,000 ain't cheap for a 40-year-old car, but it is a Mercedes after all. But BMW arguably does it better than its rivals in Stuttgart. They stuck their glorious straight-sixes into relatively compact packages and showed there could be good cars to come out of the 1970s. This 1980 733i, again, is not the last word in performance today. But even though the 3.5-liter six was watered down, to 174 horses in American form, the E23 didn't weigh more than the moon like it does now. Compared with the big American sedans of the day, the 733i was sprightly. This one even has a manual ‘box But don't get too excited, because it's a four-speed. This 733i really is a time machine, though, with less than 30,000 miles, more fake wood (seriously, guys) and the most old-school Blaupunkt radio I've seen in a long time. But that's just it with the 733i, it's more a piece of history rather than a genuinely great sedan today – even at its relatively low starting bid price. The E23 was before the 7-series got really good, and this model looks genuinely quirky next to the 280SE. I'm a huge fan of old BMWs, but this generation of 7 doesn't quite make the cut. The Merc, on the other hand, is from the heyday of their big sedans. I don't think Mercedes has ever properly filled the void left by the W108s or that of any of the models it made when they were less concerned with exploring new niches than building the world's finest cars. The great thing about this 280SE is that you could conceivably use it every day. And honestly, I'd think you're just the coolest person if you bought this instead of a new Fiesta. What's your pick? Let us know in the comments.